Thanks for sharing these updates, iceflower. Sonja can even make a yellow rain hat seem stylish, haha. I've often thought that she is elegant. I love this photo of Haakon and Mette-Marit, it feels rather warm. this photo is great too of the four of them. Forgive me if this seems like an obvious question, but how long are the celebrations running for? You are most welcome I think they end with this month. If not mistaken, Wednesday was the end of their tour. Thanks for all the pictures. Some really nice pictures and a nice warm connection between the members. These tours are always enjoyable to follow. Yes, this was the end of both their tour and the celebrations. This has been a wonderful Jubilee for their Majesties, and as they both have said in speeches, they've really appreciated it. And now there are already talk here about their 80th birthdays next year. I will translate more articles in the coming days. Wow, thank you to all those who answered my question and added some more information regarding it. That was much appreciated. I didn't realise that the celebrations were lasting for this long. There was another 3 generation photo made, very similar to the one 10 years ago (2006). 13 year old Teodor and actress Wenche Strømdahl touched the royal family when they performed a very personal text. There were a number of prominent guests present during the service. 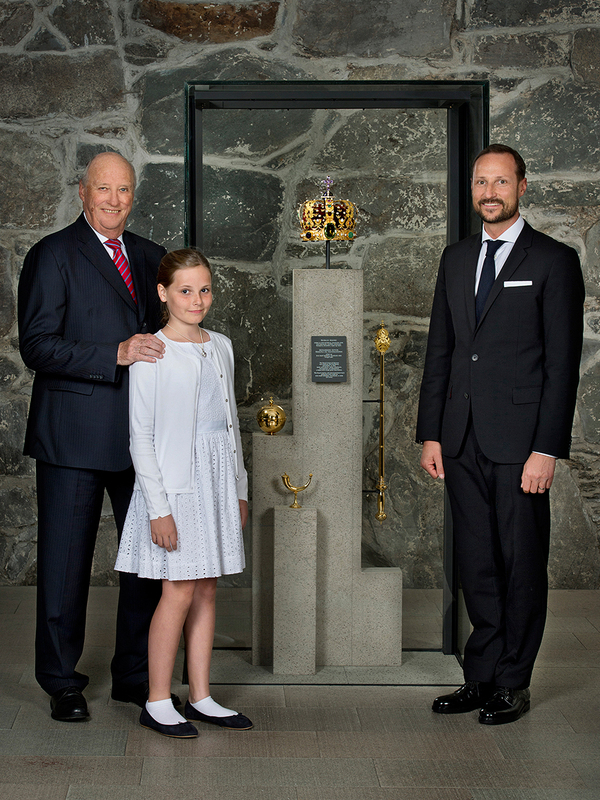 King Harald and Queen Sonja had to wipe tears several times during today's anniversary church service in the cathedral. ''It is a deeply serious legacy to be king of a country, where people are precious treasures. Then it is good that our king also inherited laughter'', said Theodore Merakerås Rasmussen. He was proud and relieved after completing the text written by Eyvind and Sindre Skeie. ''I think it went very well. Both I and Wenche managed to read exactly as we had planned. We were delighted when the King and Queen shed a tear along the way'', says Rasmussen. Now waits a more normal life for a 13 year old. ''Now we are going to take vacation, states both Rasmussen and Strømdahl. Can someone tell me where to find the marvellous text "Konge og Dronning i 25 ar" by Eivind and Sindre Skeie read by adult norwegian actress Wenche Strömdahl and young Teodor Merakeras Rasmussen at the jubilee service at the Nidaros Cathedral june 23rd, if possible in english as my norwegian is pretty bad? !